Nice Work if You Can Get It; Remind Me; I Got It Bad; Humming to Myself; I Wish I Knew; Somebody's on My Mind; Down by the Salley Gardens; A Nightingale Can Sing the Blues; I'll Never Be the Same; Polka Dots and Moonbeams; I Mean You. 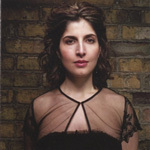 Melissa Stylianou: voce; Bruce Barth: pianoforte; Linda Oh: contrabbasso; Matt Wilson: batteria. Ospiti: Anat Cohen: clarinetto; Billy Drewes: sax contralto.